Elhumo ist an exhibition and store where fine Cordoban pottery can be marveled at and purchased. You may find a vast variety of handmade objects created by Jesús Rey who is a local craftsman. The exhibition is located in the historic center of Cordoba, adjacent to the famous Plaza del Potro Square. All objects are unique and are for sale. The pottery that is shown here is of outstanding beauty and creativity. These objects include household articles and decoration items such as clocks, lamps, human and animal figures, guitars, pots, etc. Also beautiful are climbers, astronauts, dragons, snails, centaurs, winged horses and other items. All of these objects are manufactured in the Cordoba based workshop of Jesús Rey who has more than 20 years creational experience. He is making his fine works of art from a plain chunk of clay in his small workshop, always being watched by shoppers and passers-by. 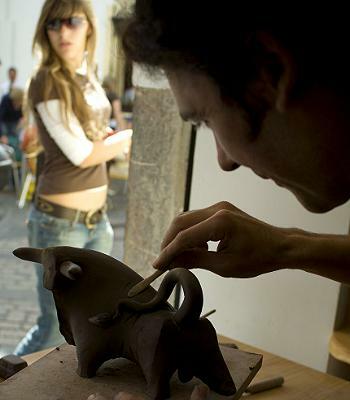 Apart from creating objects of art such as those mentioned above, Jesús Rey is making individual objects by customer order, using traditional techniques. Items are shipped worldwide on request.